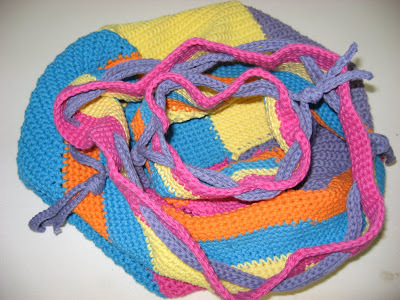 Hooked on Needles: Crocheted Swirling Bag ~ So Fun! Do you plan a special project to take along on vacation? I do, and it's usually crochet. This year, my fun crochet project was this awesome Swirling Bag pattern that one of my readers had sent me a few years ago. It's available for free from Interweave by clicking HERE. 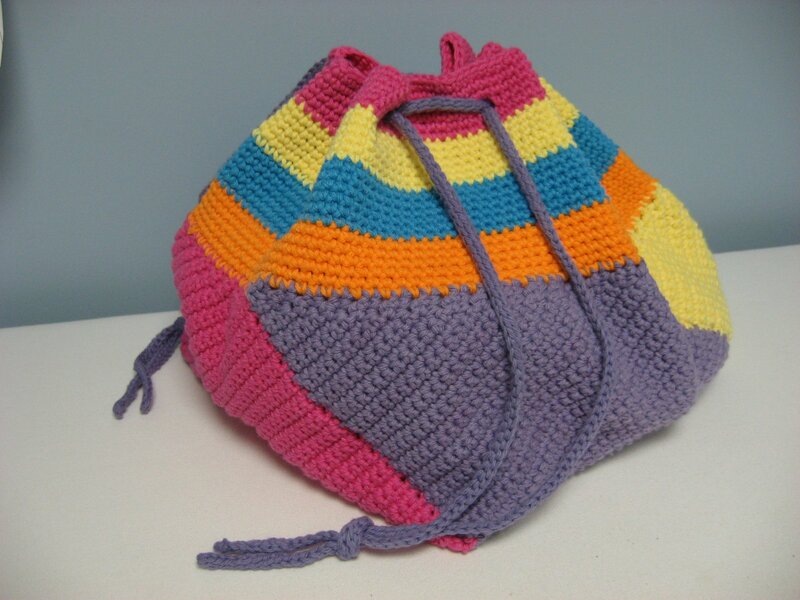 There are also a few pictures of this bag design on Ravelry which you can find just by searching Swirling Bag on Ravelry. Of course, I had to make a few changes to suit my taste because I can never make a pattern of any kind just the way it is written! Do you do that too? The first change I made was the yarn that I used. 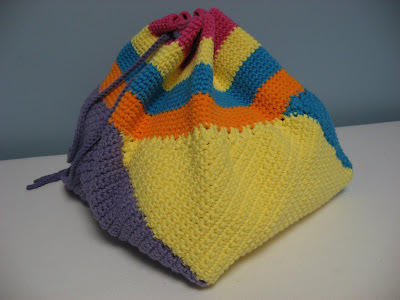 I'm very much into using up what I have at the moment, so I used some of the bright colors of Lily's Sugar 'n Cream crochet cotton to make my bag. See that orange stripe around the bag? That's another change I made. 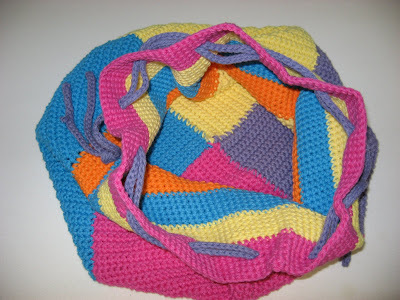 The pattern calls for only four colors, but I didn't like the idea of the first stripe around the top being the same as one of the colored sections on the bottom. So I used orange as the first stripe around the top, then I used the purple as the drawstring so it would not feel left out! 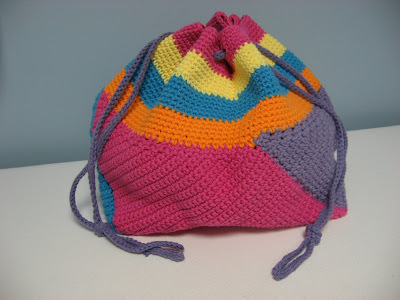 The drawstring is another change I made to my bag. 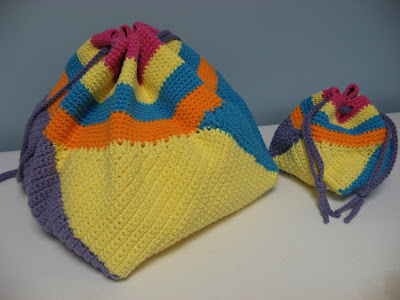 The pattern calls for only one drawstring, but I like a drawstring bag to close by pulling from both sides, so I made two identical drawstrings and threaded one in from one side and the other in from the other side so that when they are pulled away from each other, the bag closes neatly. This bag ended up to be quite a generous size and I needed more than one ball of each color, but not two whole balls of each, so I had some leftover. I decided to test my theory that if I cut the beginning chain in half and used that number as the base for a bag, I would get a bag half the size of the original. So I made an exact replica, only smaller. Isn't it cute? 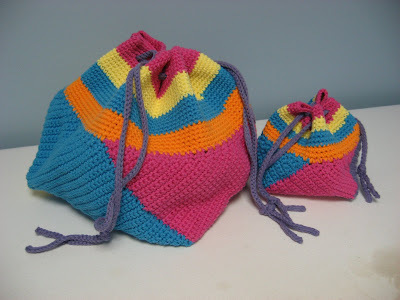 A matched set of swirling bags! Mama bag and her mini twin! How fun is that? They nestle together so nicely too! So how would you like to crochet yourself a swirling bag? Print out your own copy of the free pattern by clicking HERE, and read through it. If it seems a bit confusing, you can hold off on starting your bag until I post my picture tutorial which will be coming up very soon. There are a few things about this pattern that I thought might confuse a beginner, or someone not familiar with constructing a project like this. So I'm in the process of making another full size bag and taking lots of pictures along the way to walk you through the pattern. Be on the lookout for it sometime next week. Love your bags Mary Grace! I LOVE the small one! I found that the pattern called for 4 skeins of a DK weight yarn, but my friends had to buy a couple more skeins! I am using worsted on mine and it's really big! Love the changes you made!